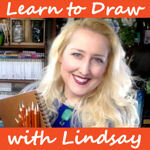 Sketchbook Sunday Portrait of a Woman & Brush Winners Announced! Hi friends! First up let me announce the 10 winners of their choice of a Mythos brush set from Royal & Langnickel from last weeks post: Gilbert, Kennedy Ramos, Annette Fournier, Sparklegirl59, Lizzie Saunders-Pacheco, Georgia Franko, Karla Lindblad, Linda DB, srwilderart and Bonnie Warren! *Winners, I replied to your comment and sent you an email to the address on your account you make comments with. Follow the instructions in your email to receive the set of your choosing. Today for Sketchbook Sunday we have a portrait of a woman in watercolor. Sorry the post is so late, I was thoroughly enjoying a lazy Sunday. I picked up a few used paperbacks at the bookstore yesterday and today I finished one (The Women of Brewster Place by Gloria Naylor) and then I took a nap! Life is good:) Anyhow, here is this weeks Sketchbook Sunday Time Lapse. By the way I just posted a real-time version of last week’s Sketchbook Sunday project (Chicken in Gouache) in Critique Club if anyone is interested. 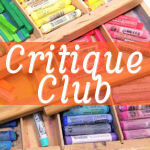 *Critique Club is a group in my Teachable school where members can share the paintings they are working on or have finished for critique and I also post real-time version of 2 of my Sketchbook Sunday projects as step by step narrated lessons. Cost is $5 a month and all levels and media are welcome to join. I hope you had a wonderful weekend and til next time happy crafting! Hi friends! I couldn’t wait to play in my sketchbook this week. I decided to use my Grumbacher acrylic paper sketchbook because the paper is fantastic and doesn’t warp with layers of paint. It also works well for watercolor but I think it’s coolest feature is being able to remove a page from the book while you are working on it and put it back in afterward as I will do today. This is one of those projects where I enjoyed the process much more than the finished project and that’s how it goes sometimes but in a sketchbook you don’t need to be perfect or only stick to safe techniques, that ruins the fun! As yourself “what if?” and try it! I also wanted to try some new supplies as several viewers asked me to try them out. The folks at Spellbinders/Jane Davenport were kind enough to send me a goodie box full of supplies from the Making Faces Collection of mixed media supplies and today I will put as many as I can to the test. I really enjoyed making this page and trying new things, I am not sure if anyone else will like it but at least you can see some new supplies in action and decide if you want to add any of it to your stash. I will go in-depth about what I think of each product (as well as substitutions you can use) below the video. Enjoy! Grumbacher Acrylic paper *works great for watercolor too! Let’s take a look at the Making Faces Collection. I don’t plan on reviewing all of the items in this line in seperate videos because there are so many but I can give you my impressions below. 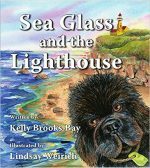 I will factor price and usefulness in my written reviews. Jane Davenport is the Maestro when it comes to selecting, inventing and packaging art products that we want to use. Her charming personality also makes us want to join in and create art. That said you probably have supplies at home that are very similar so if you want to do a project like this with what you have I will list alternatives but if you want to run out and get the cute new supplies I won’t blame you either:) I also wanted to mention that these are available at Michaels stores where there are often sales and 40-60% off coupons. I am using Michaels prices in the descriptions. You can also find these products on Jane Davenports website, the prices may vary as they are in Australian dollars but she does ship wordwide. *This is not sponsored although I did receive all of the Jane Davenport products in the review for free. Foundation Layers Stencil 3 pack ($12.99) These were high quality and very easy to use and make a front facing face. There are different options for noses, eyes and lips and you can selectively ink up the hair for different styles. 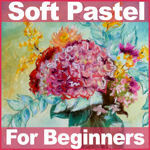 I recommend this if you need help with drawing a face or if you just want to get that part over with quickly. The downside is that the face you make will only be forward facing and the same size but it’s a good start if you need it. there are 3 stencils and a canvas board in the pack. Tip: If you have no stencil you can trace a face from a magazine! Colorsticks ($13.99) There are two collection of Colorsticks available: silky skin (neutrals) and Soul Window (bright colors) and they remind me very much of gelatos but these are way cheaper! These are probably my favorite product in the line and I find them to be a good deal and just over $1 a color full price and the container can be reused. These are water-soluble crayons that seem to fix themselves when dry. They are similar to any water soluble oil pastel you might have such as the Prima Oil Pastels, Crayola portfolio, Gelatos/Gel Sticks or Tim Holtz Distress Crayons. I did find other media layer well over this so they may be a bit less oily but the difference is small. I would recommend them if you don’t have a similar product in similar colors. They are a ton of fun and not too pricey! Matchmaker Set Acrylic Paint ($19.99) This takes the guesswork out of mixing skin tones. You get a 4oz bottle of a peach base color and then a 1oz bottle each of a highlight and a brown. You can use this to mix a solid color and paint an entire face in and then shade and highlight with other products or you can mix values as you go. This paint dries very quickly to a matte finish so I found blend the paint a challenge but take that with a grain of salt since I do not paint in acrylics often. Also the bottles have tips like fabric paint so you can easily apply the paint right to your page if you like. If that feature is not important to you a flesh/apricot/peach, brown and light pink/cream bottle of a craft paint like Delta Ceramcoat (also has a matte finish) would be very comparable at under $2 a 2oz bottle. Tip! To add more dimension to the paint you can mix with the Colorsticks! I like how the paint colors are simple and not intimidating. Blend-In Blenders ($11.99) Surprisingly this was one of my favorite products. Each sponge featured different shapes and edges so I could use it with many colors at a time and keep them separated. There was even a very firm one great for stenciling. I found the shapes of these much more useful than the wedge cosmetic sponges I usually would use for this type of thing and they washed out well but they did stain. I would avoid using acrylic with these unless you are diligent about washing your tools right away. If you have art dedicated beauty blenders I imagine these are the same and I have seen similar beauty blenders at dollar stores and discount shops for $1-$3 but I haven’t compared them. I liked these a lot! Palette Pastels ($19.99 -4 different colorways available) and Shimmer Pastels ($13-99-2 colorways available) These are similar to pan eyeshadow and Pan Pastels although they don’t seem to cover as well as pan pastels but that might be due to the softer blenders I used. I like that there are a lot of colors in a small space (honestly that is the reason my panpastels rarely get used on a mixed media piece) and they come in coordinating colors if you are unsure of what goes well together. Also, as always the packaging is beautiful and high quality (it doesn’t feel like the lid will snap off like cheap eyeshadows do sometimes.) Let me be really honest tho, a few years ago before investing in PanPastels I bought a cheap set of eyeshadows from target to see if they would work as well and used them on some projects and these worked just like my cheapies, that said the JD pastels, well the larger sets anyway, were not much cheaper and the case was more rugged so I’d say if you have cheap eyeshadow lying around that you aren’t going to use it will be comparable but if you need to go and by some get the JD because it will be about the same price. Also her pans are larger than the typical eyeshadow pans making them a better value if you had to buy new. I would recommend the Palette pastels over the shimmer pastels because you get way more colors for just a bit more money and there is a shimmery set. These are much softer and more pigmented that the tiny tins of pastels in her older collection. Licence to Quill Pen ($12.99) *I am also going to lump the Ultimate pens ($8.99) in here two because side by side the nibs and ink seems the same, there might be more ink in the LTQ pen as it is bigger and the LTQ is nicer to hold. This pen is great, the nib is responsive and you can get fine to bold lines. I’d probably wait for a coupon since $12.99 is a bit steep for a disposable pen but it is really nice. I don’t have a brush pen exactly like this but the Faber Castell Pitt brush pen would be a suitable replacement if you have one BUT if you intend on going over pastels and paint I would go with Jane’s pens as it held up, kept a dark line and didn’t clog with the media underneath. My Pitt pen was not this juicy out of the box, but if you only want to use ink on clean paper or over watercolor it’s great. Baton Blenders ($7.99 for 30) I liked these a lot because they are long enough to stand up in a cup and keep handy. Because there are so many colors you can assign a color to each blender so you can keep using them over and over again with pastels. I have used foam eyeshadow applicators for years with my pan pastels so there is no reason these won’t last a very long time assigning a color to each blender. You might even be able to split a pack with a friend. I recommend this as long as you are not treating them as a disposable product because that would be an unnecessary waste. Velvet Pastels ($7.99 each, 8 colors available) These seems to be a very thin, matte opaque acrylic that is quite durable (I know this because I swatched some on my arm and it took a lot to wash it off!) and has a built-in applicator like a lip gloss. This product seems best to add little touches to a product. Coverage on a flat hard surface like paper is tough because the foam applicator seems meant for softer surfaces (hey, it worked great on my hand LOL!) so personally I will probably use this to add a touch of color to a 3D clay embellishment or something embossed rather than an art journal page. Also to consider: it seems to be a small amount of product in an elaborate plastic container and the price isn’t cheap. Given the mixed materials in this packaging it is unlikely to be recycled. I am so sorry to ruin all the fun things in life… Of course if you are just using this as a touch here and there it will probably last you a long time. I think any matte acrylic would be a suitable replacement and you can apply it with a Q-Tip if you want a similar applicator. Magnetic Personality Brush Set ($44.99) This set features 4 very stiff brushes with magnets in the ends and a metal frame you can suspend them from or stand them up in. The stiffer filaments in these brushes make quick work of dissolving watercolor crayons and pushing around heavy body paint. The brushes are more suitable to acrylics because they are less absorbent and stiffer, I have no qualms with the brushes. The thought behind the holder is that after you wash your brush you can hang them to dry but after trying the hang the wet brushes they seemed too heavy to be held by the magnets and they fell. Hanging them while dry was not much better as they could get knocked out of the box very easily and they wanted to clump together due to the magnets. With these issues and the price I don’t recommend this product. It also takes up a fair amount of space on your table where 4 brushes could easily be put in a cup with other supplies. To be fair I am not a believer that brushes need to be dried upside down. The biggest culprit to swollen cracked handles and loose ferrules are letting your wood handled brushes sit in the water too long (like forgetting them over night and I did that yesterday when I started this project and no amount of hanging brushes upside down will correct that LOL!) Simply wash your brushes, wipe them dry and put them bristle end up in a cup. Or let them dry flat on a towel. No need for contraptions IMHO. Maybe I am missing something here, I mean you can use this as a riser on a shelf and you can put magnets on it to hold notes and stuff but it seems like an odd product to me. If I am missing something please let me know. The Palette Hotel with Built in Penthouse Storage Stand ($29.99) This I really loved, it held almost all of the collection and it was easy to fetch out the supplies I needed quickly without spilling everything else out. At $30 this is an item to use a coupon on but it is very compact and functional. A great space saver! *This was not shown directly in the video but it was on my table holding all of my supplies. In conclusion I really like the collection as a whole. These products are fun and inspiring and if that gets you to create then I am all for it. Keep in mind the prices I noted are MSRP in American Michaels stores. You will pay less if you use coupons or wait for sales. I urge you to be mindful of the packaging in the products and keep in mind what you have so you don’t buy the same color of paint or pastel in a new form if you don’t intend to just because the container is cute. As always Jane Davenport has delighted us with another beautiful and inspiring collection. We all have different tastes and styles so just because I like, or dislike something doesn’t mean that you will. You do you. Til next time happy crafting! Sketching Citrus! Sketchbook Sunday…er Monday LOL! Hi friends! First I want to wish all of my fellow Americans a happy Labor Day! It is considered the end of summer in these parts as the days are getting shorter and all the kids are back in school tomorrow! September always feels like a fresh start to me. My twins started High School this year so that means no more popping down to the local elementary school to lend a hand with this or that. It’s so weird! You kids go through life and get a little more independent each day and in turn you can be a bit more independent yourself. It’s a bit sad to see them getting older but on the other hand I am excited for the adventure that awaits them. Speaking of school…I think it is always important to learn new things. It helps keep our mind fresh and supple and puts us in the atmosphere of growth where we can find fulfillment and happiness. This might mean signing up for a class or giving a supply that you were frustrated with in the past another go to challenge and push yourself. You can find ways to grow and learn everywhere! I purchased a RENDR sketchbook a while back because it was supposed to be no bleed through paper for markers and mixed media but I soon realized that “no bleed through” meant “no blend” as well. I felt bad about buying this kinda pricey paper that I couldn’t seem to use but I decided to put it out yesterday and try it again. This time I decided not to fight with it but to do what the paper wants: layering. This also got me using my alcohol markers in a new to me way. 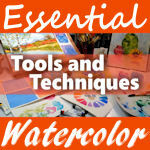 I typically work small coloring stamped images blending from dark to light in a very quick fashion. I had seen some beautiful marker illustrations recently on instagram and I realized that these artists were using markers totally differently that I was by layering! This allowed them to work a bit larger and get really vibrant results. I never realty thought of my markers as a “serious art medium” as all markers (except for Winsor & Newton Pigment Markers *use coupon code SALE818 for an extra 15%-25% off through midnight today and Winsor & Newton Watercolor Markers which are on sale now!) are fugitive, meaning they will fade in the light but hey, this is Sketchbook Sunday and my sketchbook isn’t getting direct sunlight! See a time-lapse on the layering technique here! Rendr Sketchbook there was zero bleed through on the back of the page but it doesn’t blend well so you are better off layering on this paper. If you have this paper give yourself time to learn to use it as there is a learning curve, I like it so much better than when I first got it. 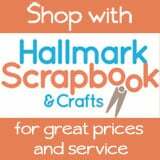 Consumer crafts is offering 15%-25% off total purchases on their website (*excluding WOW of the week) through 9/3/18 11:59pm PST with coupon code SALE818. Craft fairs and holiday crafting is right around the corner and this is a great chance to grab some deals on craft basics, art supplies and more. You never know what you are going to find so it is a bit of an adventure and the deals can’t be beat! 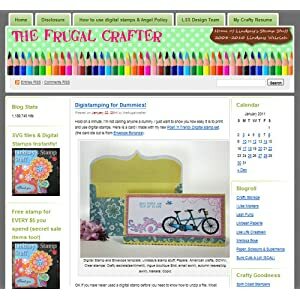 I have purchased a lot of my stencils, dies, craft storage, beads, pencils and markers from Consumer crafts as well as basic craft supplies for the library kids classes I used to teach as well as art gift sets and decor. If you know you need some of these products it pays to stock up when they have the total purchased discounts, they don’t happen often. Some, but not many, exclusions apply. Use coupon code SALE818 to get the extra discount! Sale ends tonight at 11:59pm PST. I hope you have a wonderful day! If you have today off I hope you spending it with family and friends or maybe creating some art! Til next time happy crafting! Today I am creating with the supplies in the July 2018 Smart Art Box. I had never used oil based markers other than the metallic ones you might touch up a frame with so this was a challenging supply for me to create with but I think it’s good to bust out of your comfort zone once in a while and try something new and different. If you would like to be surprised with a box of art supplies each month check out our sponsor Smart Art Box, they ship free within the US and also ship to 15 other countries *Additional shipping charges may apply to international orders. I also recommend you have a palette so you can mix some colors for greater variety. Note: You will need to prime each marker to get it ready for use as the ink is sealed in the barrel until a consumer activates it. Do this ahead of time so you won’t have to stop working. These markers are oil based but dry fast. You can block in your line work and then fill in with paint without much worry of the outlines smearing. If you need to blend or cover a large area I recommend dispensing some paint on a palette by pressing the tip firmly to the palette until the paint flows and mixing it with gamsol to the desired color and then brushing it on the canvas. I recommend working with smaller shapes than I did as I had to struggle to fill them and I had to stop to mix paint lot. This would be better for smaller art I think. If you get frustrated let the paint dry and come back and add highlights and outline again for definition if needed. Art is supposed to be fun so if you get frustrated take a break. I hope you enjoyed this video, sometimes art is a struggle but it is always good to try new things. Thanks for stopping by and til next time happy crafting! 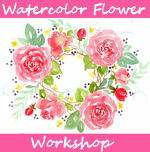 Shabby Chic “Farmhouse Flowers” Mixed Media FUN Art! Hi friends! If you joined us live on YouTube today you would have seen this painting unfold, if not you can watch the replay below! I can’t remember the last time I had this much fun playing with acrylics! Yes, I said acrylics! I used other stuff too but the acrylics were the star! I hope you enjoy this long real-time tutorial, if it’s too long you can click on the gear icon on the bottom of the video player (after you start it) and choose to speed it up. I know an hour and a half is a long time! Below are the supplies I ended up using. *Amazon and Consumer Crafts affiliate links used. Consumer crafts has really great prices and they have 20% off this weekend in the paper crafting category so you can snag the stencils and gelatos even cheaper, use the code: SCRAP518 if you end up placing an order. Also I linked to the Studio 71 acrylics because I have used them and they are a great deal and much cheaper than Liquitex but if you prefer the Liquitex brand you can find them here. Stencils (consumer crafts has the best price on stencils and I purchased the ones I used there) *plus a coupon for 20% off through 5/20/18: SCRAP518 on all papercrafts including papercraft stencils! Gelatos or Gel Sticks *Use the consumer crafts coupon code above to save 20% on these too! I ended up painting the edges of my panel white and then I mixed the violet paint I used in the painting mixed with white to make a lavender and I stamped a flourish design on the edges. I also stamped the corners with that stamp in white. 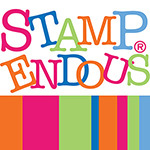 This stamp is an old one from Tattered Angels but you can probably find a similar flourish stamp or stencil it. Foam stamps also work great for this, use what you have! I hope you enjoyed this mixed media project, I sure did and it was fun to work on a rigid wood panel vs paper. I am going to hang this up in my kitchen! Hubby is repainting the cabinets white and I think this will look charming! So, are you going to give this project a try? I hope so and be sure to let me know how it turns out! Thanks for stopping by and til next time happy crafting! Ever After Winner & 20% Off Coupon! Hi – I would love the opportunity to be part of the ever after 2018 group as I started painting end of last year and I can learn so much from the classes! I am holding thumbs! Congrats and enjoy the class when it opens on July First! I am sorry to those that didn’t win a spot but I do have a treat, a 20% off coupon code for Ever After 2018. Use coupon code MAGIC2018 to get 20% off through July 5th 2018! 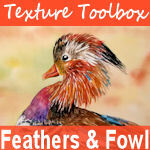 This is going to be an awesome class with 15 talented mixed media art instructors! I can’t wait to teach you and see what the other teachers have in store! If you have a sense of fun and whimsy you are going to love EverAfter 2018! They are offering several options for students wanting to take this class, they have just the fairytale class option, or the fairy tale plus style development classes and they have money-saving bundles that include previous years Ever After classes as well. Don’t forget to use the 20% off coupon code MAGIC2018 if you sign up! Please visit the EverAfter 2018 page for more information or to enroll! Programming note: We will have our weekly live stream tomorrow so mark your calendar for 12:30pm ET! Til then happy crafting!